Okay well I was *desperately* trying to finish this afghan before I posted, but due to some other projects that came up (pirate-themed baby booties, for one… no really! 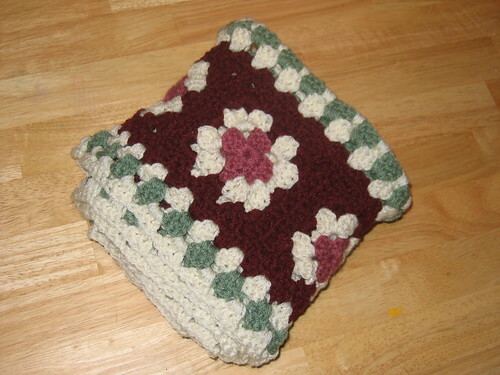 ), I only finished one strip of 6 for the Rose Garden afghan. The pattern was one of Annie’s Attic’s free-pattern-of-the-days awhile back, and was called Vineyard or some such thing. It was supposed to be plums and purples, but the colors they recommended weren’t available anymore. My daughter loves rose colors, so I went with dusty rose, a wine colored accent to it that seemed to match (and which I had a metric ton of), sage and ivory. It really will be pretty when it’s done, but OMG those multi-colored grannies! All 70 of them! Update: OH I’M SORRY DID I SAY 70?! I meant 96. NINETY-SIX. 16 squares per strip times 6 strips. Isn’t there a song called 96 Tears? I may start crying, especially if I don’t have enough base grannies sitting and home. Yeesh. Those colors are beautiful …..It will be lovely when it is all put together……please post it when complete! I used to get Annie’s Attic back in the 80’s! Didn’t even know it was still out there!!!!! I’ll have to go check it out. Yah you’re tellin’ me June… this thing will get done if it kills me. And it might *yeesh* I’m on strip #5 now of the center rose/ivory/burgundy sections (you whipstitch 16 of them into a row). The rest is pretty quick actually, 16 of the centers are whipped into a row, and then you just start going around and around…that’s the easy part. Happily, the easy part is at the *end*, or it would definitely be in danger of remaining a UFO forever!! Hey wait… 16 * 6… 96. OMFG. Who said 70, me?! Must have been from the last countdown (praying this is so, otherwise vodka is on the horizon). I’m updating the post. Hey Val… check the link to the booties (click “no really!”), or were you questioning my sanity?? hahaha (Wouldn’t be the first time…) I swear, this was a request from the mom (and not some morbidity on my part) upon seeing the fabric! 🙂 She said, and I quote “Oh my god please make me something for the baby out of that!” Wish granted! If only they were all so easy! OMGosh those booties are toooooooooooo cute! Thanks Val! The bib came out cute too… if I can just get my camera batteries charged I might even have a pic of it. I’m liking it so far. Just think: One square at a time is still a square. You’ll be finished before you know it.